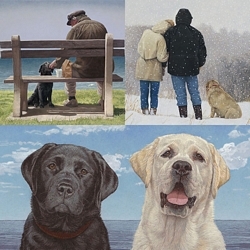 As in "Old Friends," the subjects of "Forever Friends" are the artist's Black Lab and his neighbor, Grady, a very wise gentleman of 91. Brant, the dog named after the Black Brant goose, was 12 years old. The background is dark so that the focus is on these two old friends and their expressions and interactions.